Lounge in comfort in your garden patio with the PWC-384-H Hammock from CorLiving. The sturdy hammock base is made from solid larch wood with a comfortable cotton canvas hammock sling. Free-standing design with no need for any other support, it's as simple as just placing it in your favorite backyard spot. The attractive curved frame is durable and makes an excellent focal point in any patio setting. Only simple assembly needed upon delivery, means you can relax outdoors in just minutes. The Universal Hammock Stand is constructed of heavy duty steel and assembles in minutes without any tools. Plastic caps are used on the ends of the steel tubing to create a soft finish. You will enjoy the freedom the stand provides by allowing you to set up your hammock in the most convenient location and no longer rely on those 2 perfect trees. This 8 ft. Universal Hammock stand can accommodate hammocks that are approximately 9 ft. to 12 ft. in total length. This may vary depending on how much your hammock stretches. Come on over to the Dockside! Cool frame design and super simple assembly makes the Dockside Sun Lounger indispensable for backyards. Headrest with cushion is fully adjustable, as is the footrest. Rubberized arms for even more comfort. Attention those with limited space: easily folds to a compact size for off season storage. Carousel Confetti Brazilian Sunbrella Double Hammock A top choice for challenging the elements! The Brazilian Sunbrella<sup></sup> Double Hammock offers solution dyed acrylic fabric that is made to outlast every season, year after year. It is as comfortable as cotton, but is made to withstand fading from the sun and even cleaning with bleach. 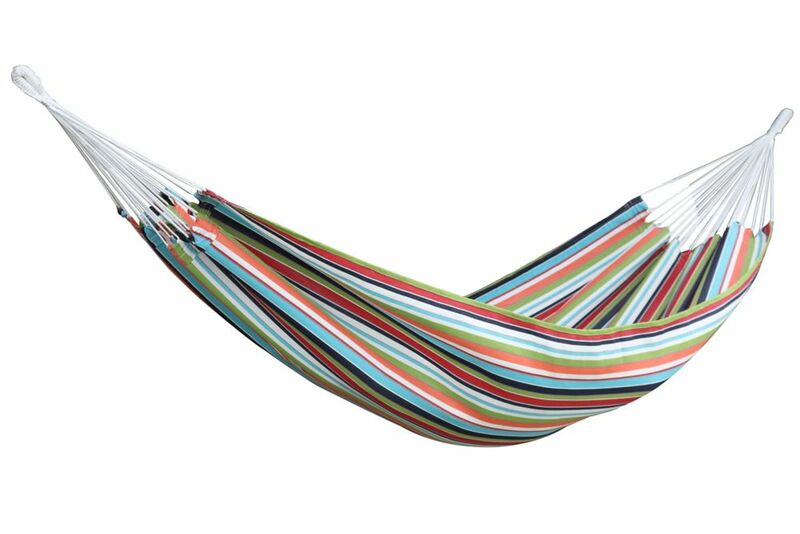 In this hammock, keep the vibrancy alive and enjoy the durability without the worry.